Sugar and Pineapple - those two words used to be synonymous with Hawaii. In a year where Hawaiians of Filipino decent are celebrating their 100th anniversary in the islands, one of the two cash crops which brought them to Hawaii along with immigrants from China and Japan is facing another long-time grower abandoning the islands for cheaper production elsewhere. Where once sugar cane and pineapple fields were strewn across most of the Hawaiian islands, now you'll find housing developments, resort hotels and condominiums and more often, just barren fields. Citing the expense of growing pineapple in Hawaii when it can be produced much cheaper elsewhere in the world, Del Monte's decision will leave about 700 pineapple workers without a job. Del Monte also cites an inability to secure a long-term lease extension from landowner the Campbell Estate as a reason for their decision, however, this claim is disputed by Campbell Estate Vice President Bert Hatton as reported by KITV - TheHawaiianChannel in a story on February 1, 2006. In that story Hatton said that's surprising because in 2001 Campbell offered Del Monte a lease extension at its current rent structure. He said, "Del Monte declined that offer." Hatton also said that Campbell offered to sell the pineland to Del Monte in three separate proposals, but Del Monte declined all three offers. Del Monte's decision leaves only two companies which grow pineapple in Hawaii - Dole Food Hawaii and Maui Pineapple Co.
Captain John Kidwell is most often credited with founding Hawaiis pineapple industry. He began crop development trials in 1885 when he planted pineapple in Manoa on the island of Oahu. It was, however, James Drummond Dole who is most credited with advancing the industry in Hawaii. In 1900 Dole purchased 61 acres in Wahiawa in Central Oahu and began experimenting with pineapple. In 1901 he incorporated the Hawaiian Pineapple Company and began commercial growing of the fruit. Dole is forever known as Hawaii's "Pineapple King." As reported on the website of the Dole Plantation, Inc., in 1907, Dole established a cannery near the Honolulu harbor, which was closer to the labor pool, shipping ports and supplies. This cannery, at one time the world's largest cannery, remained in operation until 1991. Dole is also the one who is responsible for pineapple production on the island of Lanai, once known as the "Pineapple Island." In 1922, James Dole bought the entire island of Lanai and converted it from a cactus-covered island with 150 people into the largest pineapple plantation in the world with 20,000 pineapple-producing acres and over a thousand pineapple workers and their families. Pineapple production on Lanai ended in October 1992. By the middle of the 20th Century there were eight pineapple companies in Hawaii employing more than 3,000 people. Hawaii was the pineapple capital of the world growing over 80 percent of the world's pineapple. 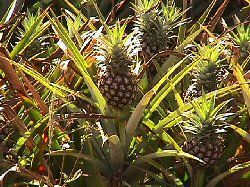 Pineapple production was Hawaii's second largest industry, second only to sugar cane. With rising costs of labor and production in the USA, this is no longer the case. Del Monte's exit will leave 5,100 acres of Campbell Estate land lying fallow. The Honolulu Star-Bulletin reports that Maui Land and Pineapple Co. is interested in the land, possibly for diversified crops. The future of Hawaii's pineapple industry remains cloudy. Maui Land and Pineapple has, however, had good success with their ventures into the specialty pineapple business with their Hawaiian Gold extra sweet pineapple, Champaka variety, and Maui Organic pineapple.